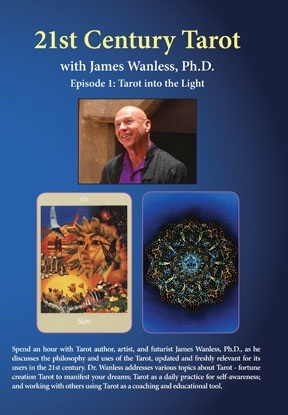 We are delighted to announce that the first episode of 21st Century Tarot, featuring James Wanless, Ph.D., is now available through our affiliate, Tarot Media Company! The video features an interview with Dr. Wanless, hosted by Anastasia Hayler, our Executive Director, and highlights from Dr. Wanless’ workshop at the World Tarot Day event hosted by Tarot-To-Go on May 26, 2007, in San Francisco, California. With his wisdom, humor, and insight, Dr. Wanless speaks to the value of traditional Tarot, with an updated perspective for the complexities of life in the 21st century. As a special for Tarot Pathways readers, if you order before May 15, 2008, you’ll receive free standard shipping and no sales tax! For more information, you can visit the Tarot Media Company website at www.TarotMediaCompany.com.